Powerful Geospatial Capabilities Designed for the Natural Resources Industry. Built on the powerful MapInfo Pro GIS, Datamine Discover is the comprehensive and essential package for the compilation, mapping and analysis and spatial geosciences data, whether you are conducting mineral exploration, hydrological analysis or environmental assessments. With Discover, you can analyse and manipulate high-resolution imagery and grids with ease, create drillhole plans and sections and perform geostatistical analysis. With Datamine Discover 3D, you can effortlessly transition MapInfo Pro datasets into an intuitive 3D environment. Rapidly visualise, evaluate and model your drillhole and related datasets in true 3D, and then dynamically test your theories. 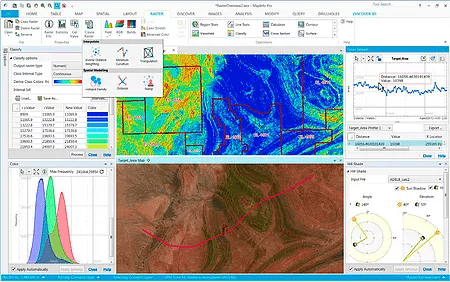 Make informed decisions based on an integrated and accurate view of all your data with support for over 100 industry-standard formats, including connectivity with popular geoscience applications (e.g. Leapfrog, Datamine Studio RM, AcQuire and gINT), as well as image rectification, reprojection and batch ECW import capabilities. Maximise the value of your data with a wealth of advanced analytical functionality, whether you are performing anomaly identification, drillhole targeting, multielement analysis or remote sensing, Datasets can be assessed dynamically in statistical, spatial, temporal and graphical views. MapInfo Pro Advanced provides a comprehensive and super-fast set of raster grid interpolation, modification and analysis tools, equally capable at the prospect or continental scales. Boreholes, drillholes and trenches can all be visualised and analysed as detailed and easily updated cross-sections and plans. Produce high quality output more quickly and easily than ever before with the new and intuitive Layout Designer. Ensure professional results with a vast range of adornments, from embedded 3D views and location plans, through to map grids and titleblocks. Seamless integration of geochemical, geological, environmental, geophysical, drilling and cartographic datasets into a single GIS environment. Create, annotate and analyse detailed drillhole cross-sections, long-sections and plans. Powerful 3D visualisation, modelling and analysis. Comprehensive support for the MultiResolution Raster (.MRR) format within most MapInfo Discover tools, including multi-banded rasters. The drillhole module implements MapInfo Pro 16.0's Geopackage as the core database, natively storing your drillhole data as a complete 3D geometry dataset. Datamine Discover 3D seamlessly extends the MapInfo Pro GIS into 3D. Visualising your data in 3D is easy, whether draping aerial photography over a terrain surface, assessing drillholes or viewing geochemical datasets. Datamine Discover 3D is also projection-savvy, with on-thefly dataset reprojection ensuring a comparable experience to MapInfo Pro. Gain a fresh perspective on your data, identifying and analysing subtle trends in 3D simply not apparent in the 2D environment. Powerful modelling capabilities, from solid wireframing and extrusions through to block/voxel model interpolation. Intuitively navigate the 3D environment with our new onscreen controls, or plug in a 3DConnexion SpaceNavigator controller for instinctive 'fly-through' navigation. Share 3D environments with the free Discover Viewer and produce eye-catching and immersive movies of your project with dynamic data content.